When I began art journaling, my primary goal was to enjoy the process. I didn’t want to worry about what other people thought, or even whether or not I liked each page. I wanted to play, explore, and create — and let the process itself be my pleasure. As a perfectionist, it has been hard, at times, to keep that perspective. So every now and then, I remind myself — as I did with this page. I like the way the book page shows through the background of this page here and there. I used inks, paints, stencils, collage, rubber stamping, transfers, and stickers to create this arrangement. The title words “Enjoying the Process” were torn from a magazine. A few strips of “flaming” washi tape added pops of colour, and a black sharpie provided some loose definition around the edge and some of the elements. 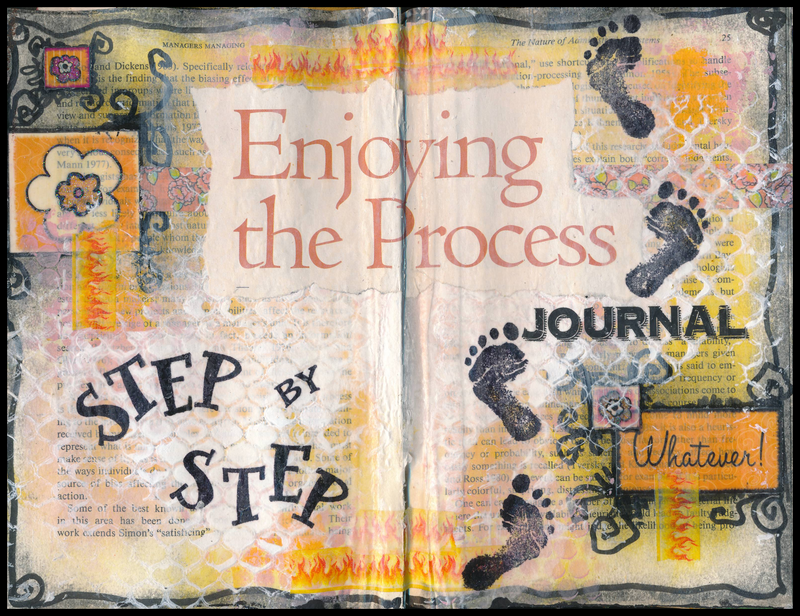 Like life, art journaling is a step-by-step process. The beauty is in enjoying the journey along the way, rather than waiting until we arrive at our destination to be fulfilled. ← Art Journal – Live! Always enjoy looking through your journal pages Janni. Beautiful and cohesive. Each of my pages are radically different as I explore and are inspired by other people’s art.